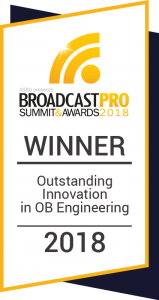 This radio OB Van represents a totally brand new concept for this category of vehicles and makes it the first of its kind. 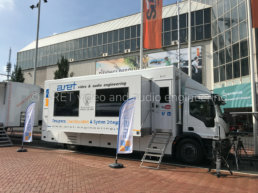 The vehicle, based on an IVECO chassis, was designed and built exclusively on customer specifications. 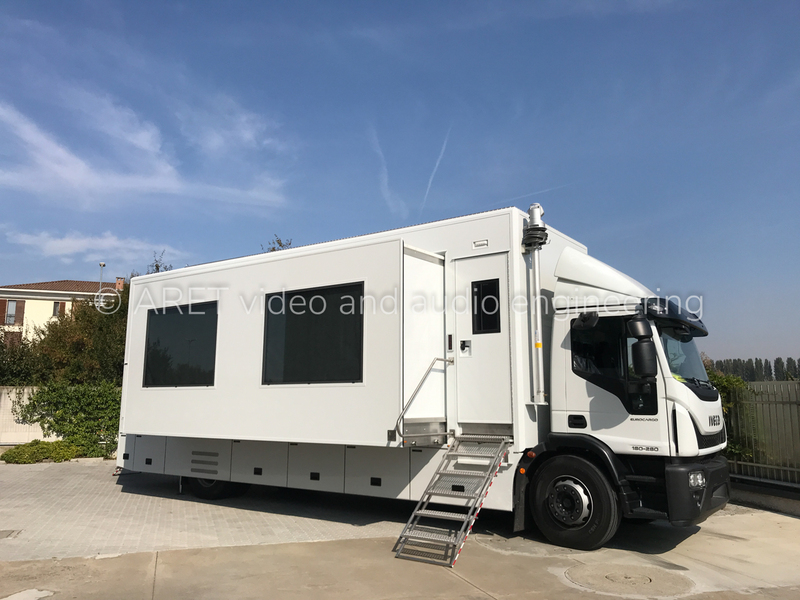 The client, based in the Middle East, required a special OB Van that could endure the harsh weather conditions of the region and quickly operate under any circumstance. One of the peculiarities of the vehicle, in fact, is that it can be fully operational with the lateral expansion open and closed. The interior is divided into two large operational areas that are connected, when the lateral expansion is open, by a side corridor. Two wide windows in dark tempered glass are embedded in the wall of the external expansion providing a clear view from inside to outside. 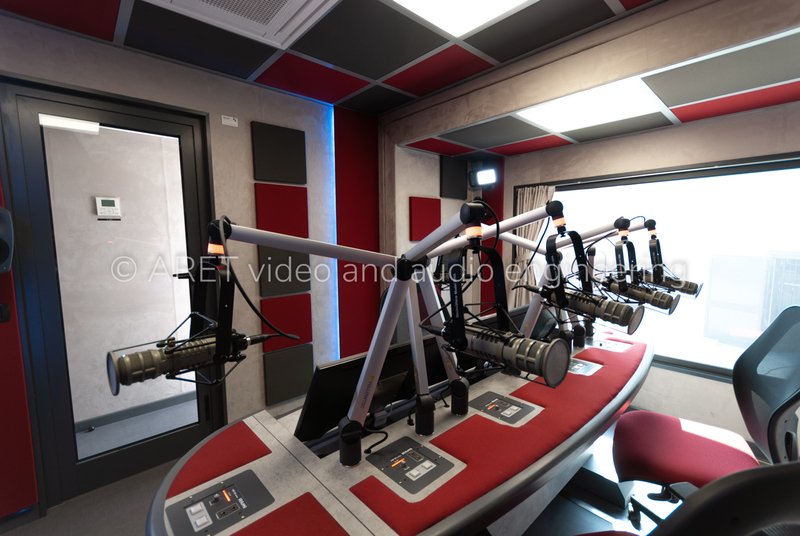 The use of these large windows comes from the desire to create engagement between the conductor/guests of the radio program and the external public. 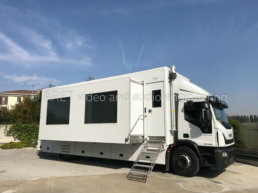 This often occurs when the OB Van is utilized in circumstances where there is an external audience, such as in squares, concerts, and stadiums. 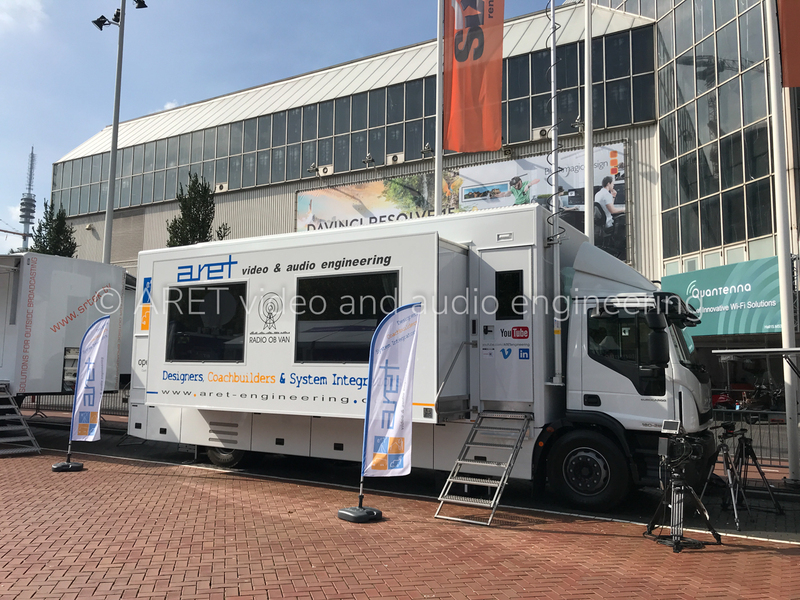 Always with the purpose of creating more synergy with the public, the OB Van is equipped with a PTZ camera positioned on a telescopic mast (with a maximum height of 8 meters) that allows shooting external images of the location of the crowd. 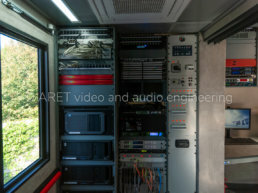 It is possible to access inside the vehicle through a rear and front entries, both positioned directly on the OB Van’s main structure and not on the side expansion: this strategic placement of the entrances allows to access the internal areas both when the expansion is open and closed. 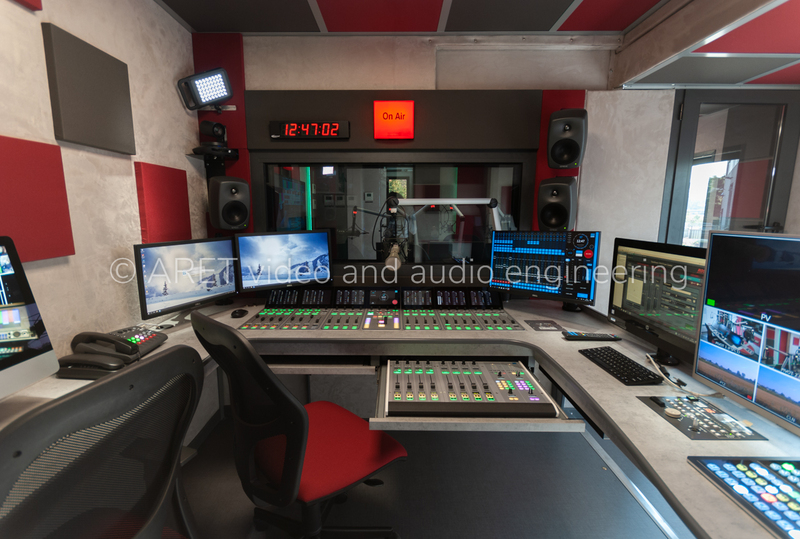 By accessing the OB Van from the front door, there’s a small antechamber that serves as a waiting area before entering the main studio. 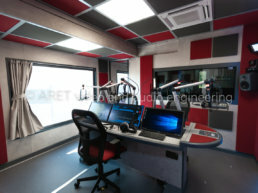 This entrance area prevents anyone that wants to access the OB Van from disturbing the progress of the programming while the transmission is On Air. 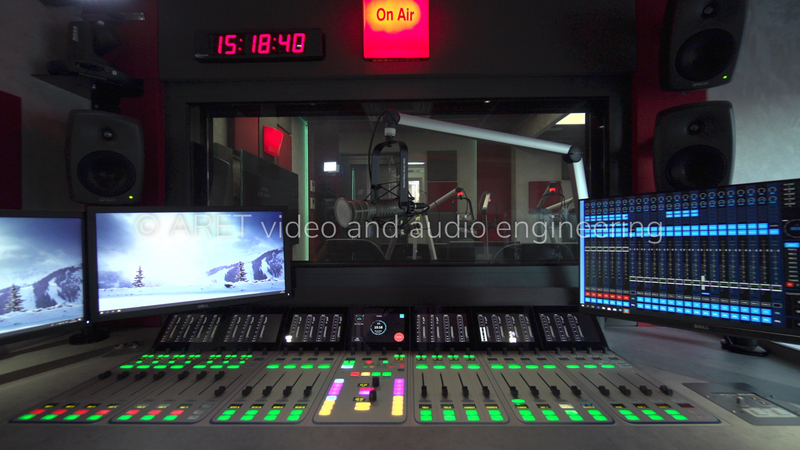 The images coming from the PTZ cameras can be seen live on the 49 ” monitor inside the studio, that can also be used to view the signals coming from the multiviewer or the computers installed. 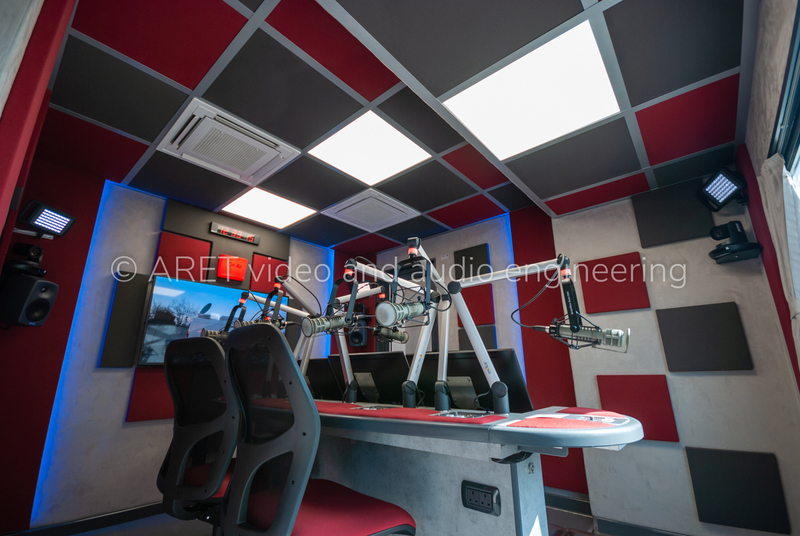 Acoustic treatment designed to absorb the energy generated by the intense sound pressure generated within a small size environment. Inside the walls and ceiling, two layers of a specific/high-density material have insulating properties and can dampen the noises coming from the outside. These layers are compacted and completed with wooden paneling, on which is applied a coating made of a sheet of polyurethane foam that is, in turn, covered with a soft cloth-like material. 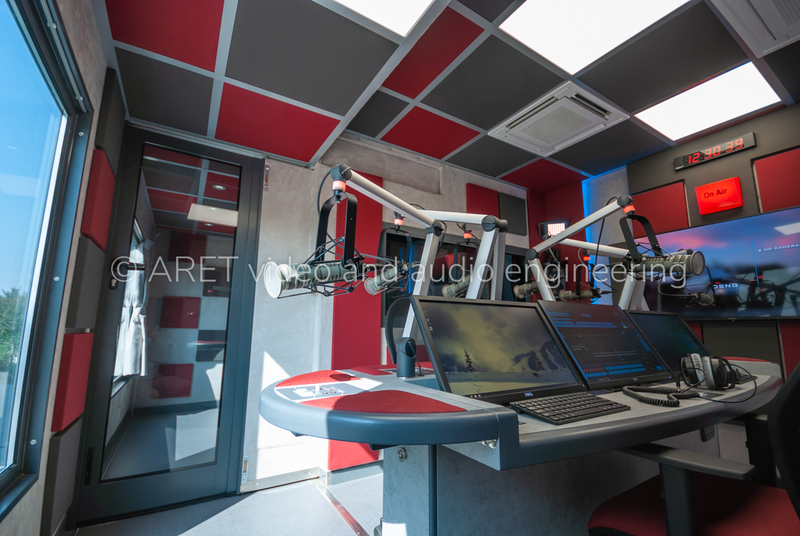 A large double glazing-insulated glass (for soundproofing) is located on the wall that divides the studio from the technical area, enabling visual communication between the two environments. 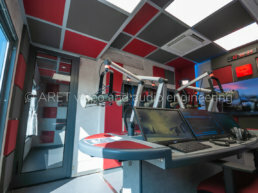 The technical area, designed with a U-shaped console, aims at maximizing the available space and can accommodate up to three operators. 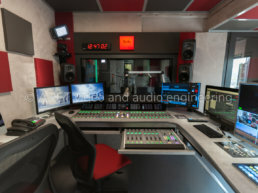 The heart of this Radio OB Van is based on Lawo technology: the main mixer is a 24-fader Sapphire console (with electronics, DSP and redundant power supplies), while the backup mixer is an 8-fader Crystal console. 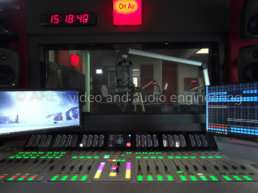 Both mixers are connected to the Lawo management software VisTool, that allows to expand its functionalities and to be also controlled from the adjacent radio studio by a touchscreen monitor. 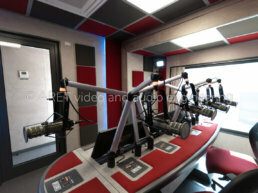 An additional Ross PIVOTCam, placed in the corner of the technical room, allows to also shot the operators and technicians during On Air operations. 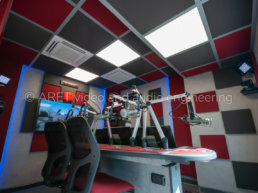 The walls and the ceiling of the technical room have the same composition, acoustic treatment and sound insulations properties such as those of the main studio. Finally, in the rear part of the truck, a small apparatus room, acoustically insulated from the technical area, hosts all the equipment and also acts as a storage compartment. Each area, including the racks, has a completely redundant air conditioning system. 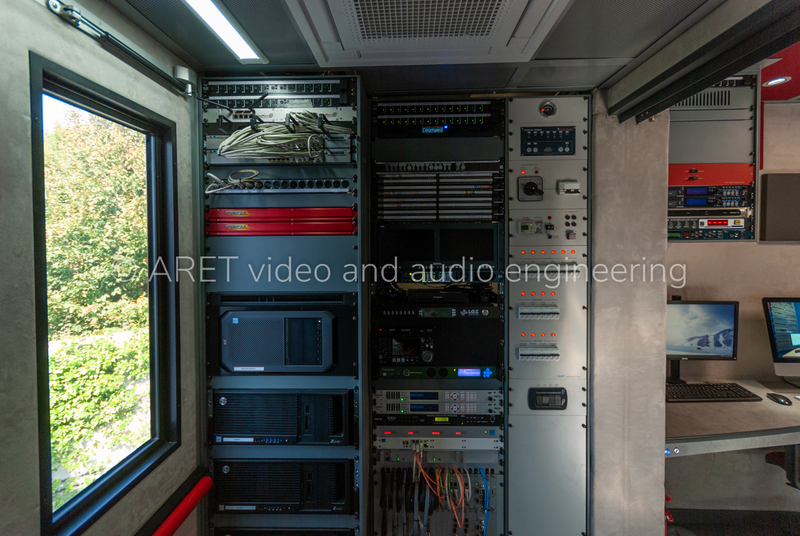 Besides, this OB Van, as per ARET standards, has an automatic leveling and stabilization system, that can be operated through remote control, and a logic system for controlling mechanical movements and transport conditions.